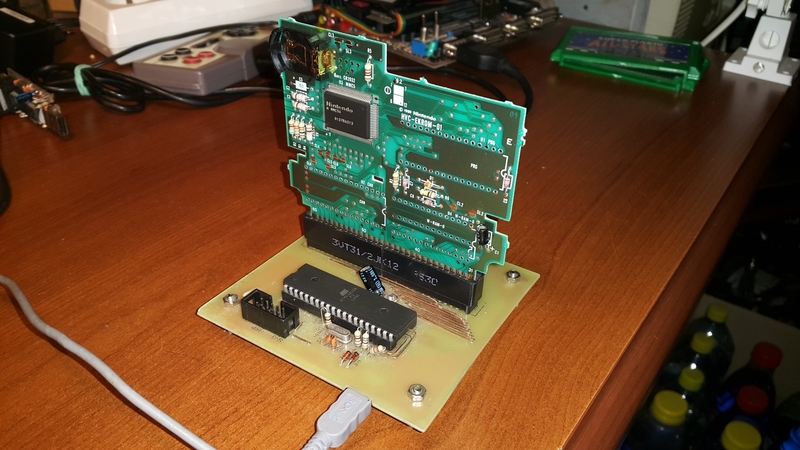 While creating repro of Super Mario All Stars for MMC5, I had to implement MMC5 in FPGA. 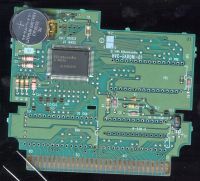 For some unknown reason, creators of this cartridge used the ability of MMC5 to supply diffrent CHR banks for sprites & background. Of course they also use the IRQ, so I come back into trouble of thinking how MMC5 scanline detector works. I am also very curious about the unconnected pins. They are wired and cut out of edge from board, this is super crazy. Also, multimeter test shows internal connection. I think they might be related to the WRAM. 0. Multiplier ($5205/$5206) -> after writing A and B, low(A*B) and high(A*B) can be read immediatelly on next cpu cycle (no need to wait 8 cycles like in mapper90). This means that the whole product is calculated as combinatorial function and it requires quite a lot of ASIC resources. The 8 cycle delay in mapper 90 is because after every cycle, each succesive bit of B is multiplied by A and added to the result causing much less resource need. 03. Will 3 reads with A13=0 trigger it? 04. Does the PPU address matter or only A13 is checked? 05. What if there are more than 3 fetches per row? so the scanline detector starts working one scanline earlier. Later I will check the memory protection bits, because I roughly tested it few days ago and I think that when M2 stops toggling, these bits are automatically set (like if reset happened). No idea how MMC5 checks without help of external detector that this happened. I wouldn't be surprised if pins 73 and 75 were "PRG RAM /CE" and "PRG RAM A15". And if one of 29 or 30 were "PPU A13 OR PPU /RD". But that leaves a number of pins. I am also very curious about the unconnected pins. They are wired and cut out of edge from board, this is super crazy. 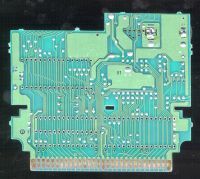 The vast majority of Nintendo-made boards have those, this is nothing MMC5 specific. 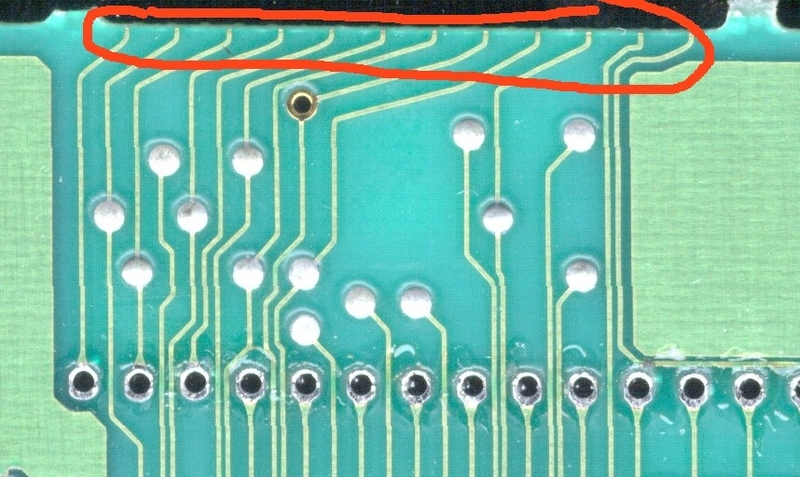 Old PCBs often have areas where several traces meet together and then appear to have been drilled through that crossing to electrically disconnect them. Just a guess, but I think these "crazy" routings allowed for PCB continuity testing prior to drilling step that breaks all the testing connections. 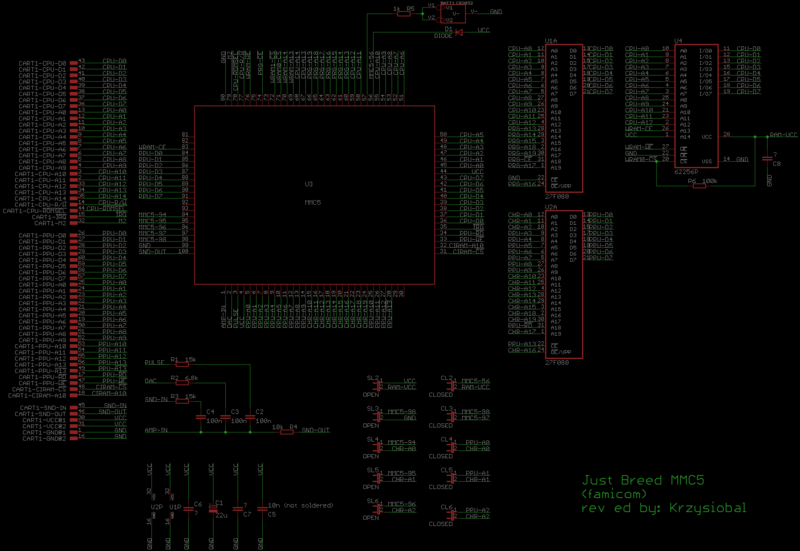 Perhaps the traces that run off the edge of the board connected to a testing header of sorts. You really think there has been test pads in the place where there is hole now? I rather suspect that this is some copy-protection policy. 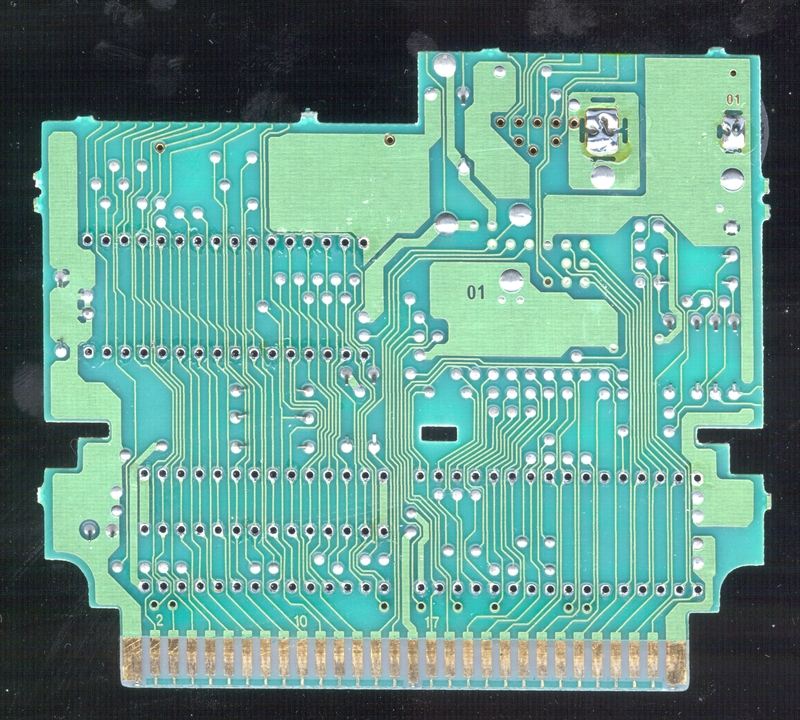 Nintendo ordered big PCB sheets containing more small PCB cartridges on them, with some fake tracks and connections between those small carts and later, they cutted and milled them on their own or in another factory to minimize posibility of leakage. I rather suspect that this is some copy-protection policy. Hahaha ! I like how every single time something is not understood in reverse-engineering, someone comes and claims "this is a form of copy protection". Could be, but not necessarily. There is a 4 cycle gap between an STA $abs and an immediately following LDA $abs instruction, so the MMC5 might take advantage of it for its multiplier. Another possibility is that their EDA software wouldn't let them have a trace that didn't go anywhere, so to silence it they sent it to a connector that they then milled out. That's an example of where they all shorted together like I mentioned. Perhaps that massive shorting of signals provided continuity checks at the header that would be off the edge. I'm saying the signals that went off the edge of the board is where the header may have been. This is all just a theory though. I find it hard to believe it's copy protection and Nintendo did post manufacturing. I've wondered if lidnariq's theory might be the case as well, some artifact of early design tools. Nah the answer is a lot more pedestrian. It's because they need to short all the lines together that they wish to gold plate. There's a shorting bar on the card edge where it plugs into the system, and then more shorting bars around the edges of the board. These cartridge boards use hard gold (vs. ENIG) and this is a plating process, so everything you wish to have gold on needs to be electrically connected. The boards are plated, then the shorting bars are routed off, breaking all the connections into their separate circuits. You'll find that most if not all of the connections that run off the top/sides of the board are all internal" connections- i.e. 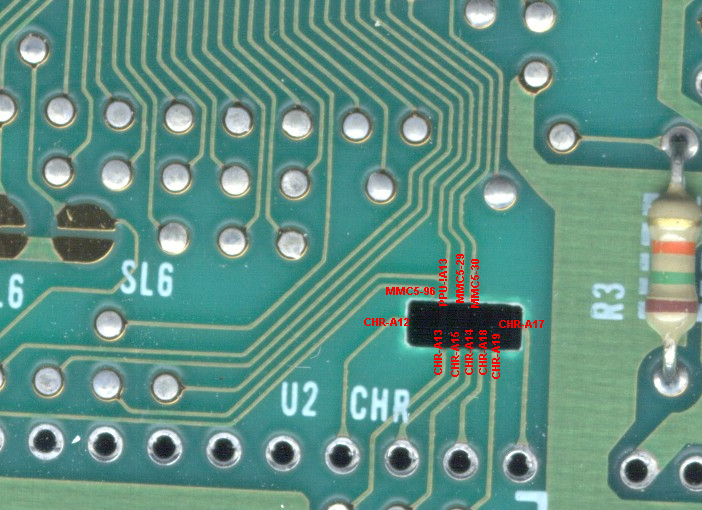 signals from the MMC5 to the ROMs or WRAM and signals that do not actually make it back to the card edge. 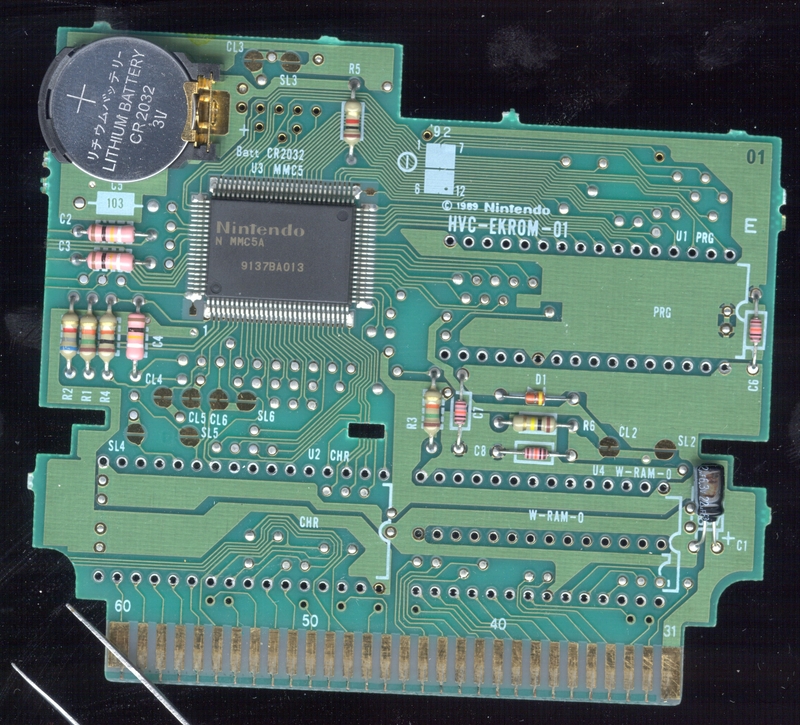 This is found on nearly all (if not all) nintendo-made cartridge boards. Ahh that makes a lot more sense. Guess I was right about intentional shorting and off board connection, but for the wrong reasons... Thanks kevtris! But why would you need to plate any signals that don't go to the card edge? All vias are gold plated. I accidentally found out that the Super Mario All Stars hack, which uses MMC5 mapper, does not work correctly using my devcart when played on PAL NES (on Dendy & NTSC Famicom it worked fine). After investigation I found out that interrupt was not launched at all because scanline counter was reset during frame few times and never had chance to approach the value. While Dendy or Famicom NTSC has 3 : 1 PPU/CPU clock ratio, PAL NES has 3.2 : 1 which caused sometimes unalligned checks. Incrementing it to take into account not last three M2 clocks but five solved the problem, but I am really curious how real MM5 copes with that.